This tapestry of coast, forests, countryside and water in Normandy provides a seemingly unlimited diversity of outdoor activities. Whether by foot, horseback, canoe, kite surf, parachute, visitors to Normandy get the best of what we have to offer – the Great Outdoors. Quiet country roads, forest tracks and dedicated cycle paths make cycling an absolute pleasure in Normandy. If you prefer not to take your own bikes with you there are many cycle hire centres throughout the region, and in some cases hotels and Chambres d’Hôtes will lend you bikes and helmets so that you can explore the local area. The whole family can cycle in complete safety along the new Avenue Verte between Dieppe and Forges les Eaux or, armed with nothing more than a map, you can follow the signs along the Pilgrims Way heading south from Barfleur. Pick up an illustrated leaflet on the Cider, Traditions or Cheese Routes from the local tourist board and you can discover hidden corners of the region at your own pace. 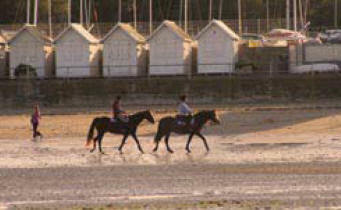 A discovery of Normandy would be incomplete without a mention of this region’s passion for horses. Tourists are welcome to attend the numerous horse shows in Bagnoles de l’Orne or Deauville or visit the many horse breeding estates, of which the Haras du Pin and Haras de Saint Lô are the most exceptional. whether it’s for just a few hours gentle hacking in the forest in Eure, or crossing the Mont St Michel bay on horseback for a once in a lifetime experience, a few days touring along coastal paths and beaches of Cotentin or through the verdant slopes of the Suisse-Normande. Rambling and hiking are popular pastimes as Normandy provides hundreds of miles of hiking and recreational trails for enjoyment where perfect infrastructure enable people to explore the countryside at their leisure. Numerous footpaths ply their way through changing landscapes, criss-crossing the region, and meeting up with other tracks such as the numbered “GR” or Grande Randonnée routes which link Normandy with the rest of France and Europe. Suggested itineraries can be found in Tourist Offices and a map is available on request. In the heart of the countryside, near Vire, is the Bungy Jump centre. The bungy jump is done from a disused viaduct designed by Gustave Eiffel, which spans the Souleuvre river, and offers those who are eager to test their courage get a chance to experience a different view of Normandy. 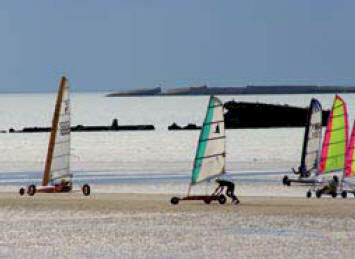 Whether it’s sailing, canoe-kayaking, kite surfing or wind surfing, Normandy has excellent facilities around the coast and inland. For those on holiday who want to take out a boat just for a few hours, there are plenty of sailing centres which will hire out equipment. For more information check the County Tourist boards web sites at the end of this brochure. 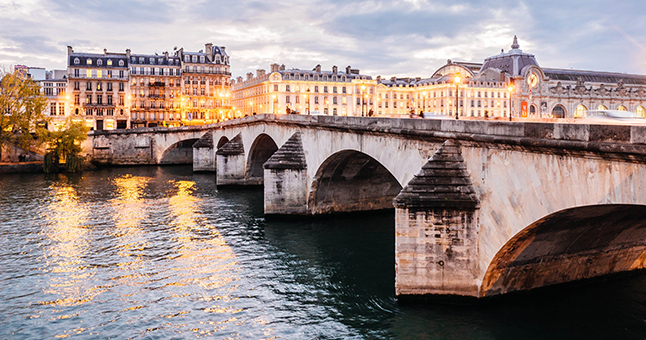 Blessed with more than its fair share of rivers, the region is considered one of the best in France for salmon fishing and also for sea-trout, whilst brown trout are multiplying faster here than elsewhere nationally. 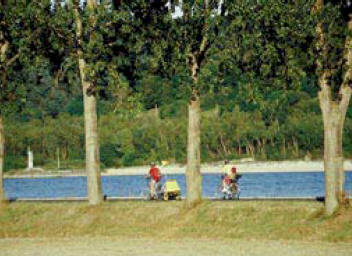 Anglers are not confined to just fishing the rivers – there are also many lakes and former gravel pits where the sport is pike or carp. The brochure “Pêche en Mer et Rivières” is available on request with all the best fishing spots. Golfers have been flocking to Normandy for years, attracted by the accessibility of the courses as much as the accessibility of the area, sea views, verdant greenery, stunning landscapes and a warm welcome. There are around 40 golf courses in Normandy, twelve of them enjoy sea views, and several of them boast a long history having been founded nearly a century ago. The majority of the courses have been designed by renowned British or American course designers, and have matured and improved to offer perfect golfing experiences. The courses are all open to non-members, and offer short- breaks and golfing holidays. 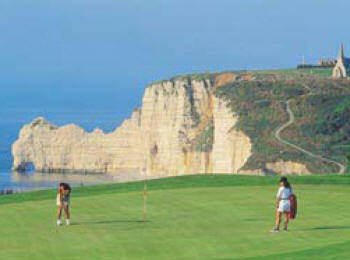 The brochure “Golf in Normandy” is available on request and identifies all the best spots for golfers.